Image: Book Launch function at the Rajiv Gandhi Handicrafts Bhavan, New Delhi presided on by Shri Shankarsinh Vaghela, the Honourable Minister of Textiles, Government of India. This project was handled at the National Institute of Design from early 2002 when the proposal was drafted by the NID team and it went through many phases of research and design till the book was finally in print by the end of August 2007. However the book release was delayed for various reasons but we now hope that the sale and distribution copies will be available widely in India and overseas through the Mapin Publishing network as well as the Office of the Development Commissioner of Handicrafts, Government of India. The list of people involved in the various stages of work and on various aspects of its creation are listed on pages 562 and 563 of the book and this list is reproduced below for the blog post here. Besides these contributors listed in the Credits pages we have listed a full set of implicit contributors in the form of an Annotated Bibliography from pages 551 to 556 covering the numerous crafts documentations studies done at NID over the past 40 years that have been a foundation on which this particular structure has been built for the production of this publication. Further, pages 558 to 560 has a list of all field contributors with whom our teams had interacted and drawn support from during the elaborate field work phase that was done over the four years when the content was being compiled and verified through forays in the field. Page 561 has a list of all Museums and private collections from which images or samples were referred for filling in some of the material that has appeared in the book. The bibliography and list of useful websites are listed in pages 556 and 557. We do hope that much of the material in the book will appear as part of the proposed web portal that is planned as phase four of this very interesting project in the days ahead. This would be modeled after the emerging web 2.0 paradigm and be an interactive platform that can assist our vast crafts community to connect with the world in new and exciting ways. This would be the foundation for the growth of the creative economy of the future that is based on the enormous crafts skills of India that we hope will be strengthened as we move forward from here. Image: Screen Capture of the Credits page from Handmade in India. The full text is listed below. Credit acknowledgement is also due to the unnamed students and faculty members at the National Institute of Design who have helped in putting this book together through their lively interactions and occasional contributions. We would like to acknowledge the offices of DC(H) across India, who supported and facilitated the field research. Further Regional Directors and Assistant Directors of Marketing & Extension Centres (named below) and their respective colleagues (too numerous to be listed here) helped put together a comprehensive check list of resources in and around their respective centers in a collective effort called Panorama Series, 2002, which was used as a base document for field work. Book design by Ms. Zenobia Zamindar and Girish Arora. End matter includes a Technical Glossary, Annotated Bibliography, Craft Categories, an Index and also a detailed Acknowledgement and Credits. Co-published in association with COHANDS and Development Commissioner of Handicrafts, Government of India, the book is produced by Mapin. Image: Front and back cover of the new book and one sample page from the Rajasthan section dealing with the Ajmer metacluster. The book is to be released for the public on the 21st of July 2008 at a brief function at the Rajiv Gandhi Handicrafts Bhavan on Baba Kharakh Singh Marg, New Delhi by , Shri Shankarsinh Vaghela, Honorable Minister of Textiles, Government of India. The book is distributed by Mapin and will be widely available in bookstores in India and overseas. Handmade in India, An encyclopedia of the crafts of India is a tribute to the Indian craftsperson and is organized by the geographical distribution of the crafts across all states and regions of the country. The Indian craftsperson has demonstrated an uncanny understanding of materials which is combined with a mastery of the tools, techniques and processes that have evolved over the centuries through social and cultural interactions, a tribute to the creative design abilities of the village society. The Eames India Report talks about a search for the values that is uniquely Indian and it is here that the study of Indian crafts will help inform current and future actions in the continuous evolution of the economy and the form that it takes in shaping the culture of the land. Today this craft continuum constitutes an enormous resource that can be harnessed for the future development of our society, particularly as the backbone of a creative economy that is enabled by the embedded knowledge in the traditional wisdom of the sector as well as the digital technologies that help connect this ancient skill to new and future opportunities for the craftspersons across India. We will need to make this enormous knowledge base accessible to planners, business and the rural and urban craftsmen as well as connect these to new local and global opportunities for these skills and resources to be reinterpreted in imaginative ways. 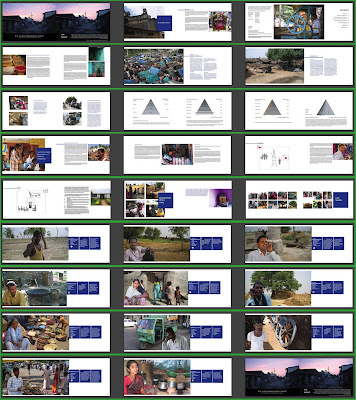 Image: Sample pages from the Rajasthan section. Each section has a master State page which is followed by the Meta-cluster pages and in each of these are the Crafts pages. 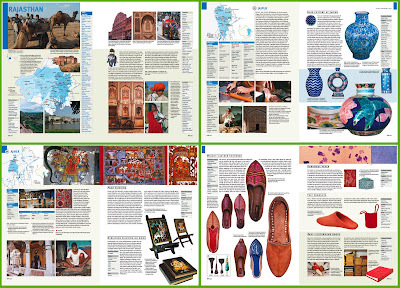 Shown above are the State double page spread (top left), the Jaipur meta-cluster spread and the Blue Pottery craft (top right), the Ajmer metacluster spread with the crafts of Phad painting and Miniature painting on wood (bottom left) and finally the double spread that includes the crafts of Mojari making, handmade paper, felt products and the Bahi – the clothbound book crafts of Rajasthan. These examples, we believe are some of the foundations of the creative economy of the future in a web enabled world and easy access in both directions which promises to link the craftsmen to new markets across the world. For this scenario to happen there are several steps involved and the book will be the first in offering insights and data on this vast resource as well as be a vehicle that can provide a platform and a structure to enhance this knowledge. Using the new digital networks and tools of access and interaction that it provides, this knowledge can be put to good use provided the required investments are made in infrastructure and training to realize this inherent potential. It is our intention that the information as well as the framework of situated keywords provided in this book will help all concerned with the promotion, development and use of the crafts of India and that they would be empowered to build a sustainable network of live information. This we believe will help our craftsmen re-connect with world markets, just as they had been doing for centuries in their own village and in their trade route networks of the past, and now the world can be their new village economy, if they are enabled and empowered to change, to meet these new circumstances with access to information that is both live and relevant. Image: Two models that were prepared in the early 90’s to capture the scope and intentions for the promotion of the crafts sector in Rajasthan and across the rest of India which led to the setting up of the IICD, Jaipur. We were asked to imagine and envision the format and scope of the new Institute for Crafts in Jaipur and today this is an active centre for the creation of change agents hwo are capable of working in the transformation of the crafts sector in India. We will need more such initiatives in the future in India. “Handmade in India”, is the first of three books, in the series Crafts of India, that are planned. It provides a geographic organization of craft distributed across the length and breadth of the country and shows how craft permeates even the remotest corner of India. It is a confirmation of more that 40 years of effort by faculty and students of the National Institute of Design who have sustained their interest in the crafts of India as a design and development resource for the country when few other organizations showed real interest in what was seen as a glory of the past. That it is a living resource as well as a resource for the future is something that we would strongly advocate and call for sustained investments from both government and industry to ensure its continuity. The realization that it can steer the creative economy for the benefit of an estimated six million crafts persons is a real possibility. These craftspersons have kept this knowledge alive in a tacit living form through their actions and traditional methods of transmission which we are now trying to capture in an explicit format between the covers of a book. 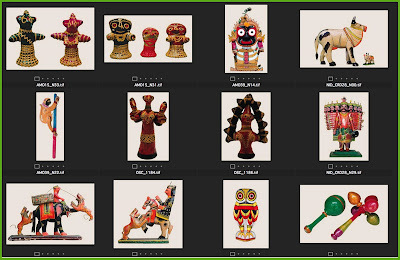 Image: A small collection of colourful toys from a variety of materials by Indian craftsmen from many locations that are featured in the book. We have had thinkers from the past comparing the crafts of India with the oceans of the world, vast and impossible to put into a bottle of any kind. We are very aware that it is only the whole earth and its gravity that can act as an adequate container for the oceans and water bodies of our planet’s ecology. Our crafts traditions and practices can be compared to this vast ocean and it is only the tips of the ice-berg that are visible in the book and we hope that the web and the digital networks that are built in the subsequent phases can support and play the role of making the rest of the hidden volume visible and accessible in the days ahead. It is a pleasure to see the realization of a dream and the fructification of the efforts of several generations of NID designers as well as a large team of contributors who have made this book possible. With sustained support from our sponsors The Development Commissioner of Handicrafts, Government of India, the COHANDS, and the expertise of Mapin Publishers as well the members of our Institute, the National Institute of Design this product is a reality today. They have provided us the opportunity of producing this work and we look forward to an active period of cooperation in taking this forward to the next stages through books two, three and beyond on the web as a major portal for the Handicrafts of India. The Council of Handicraft Development Corporations (COHANDS), New Delhi. Image: The Indian “Thali”, a platter with a mixed set of offerings that are balanced and cooked to suit the occasion and the season, each region has its own varient and the exquisite food can be served on a leaf plate or all the way up the ladder in a silver one. 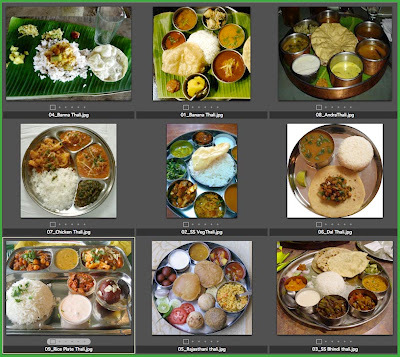 Pictures sourced from Google image search for Indian thali. 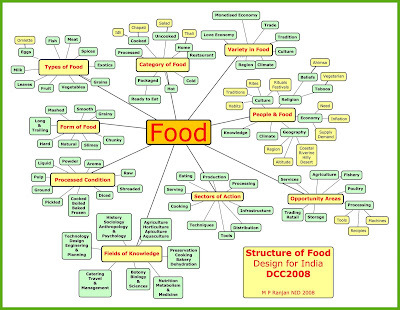 This year the theme for the Design Concepts and Concerns course at NID Gandhinagar, Paldi and Bangalore deals with food. With rampant food inflation that has hit the economy over the past nine months and the looming threat of a runaway price of oil which has slowed down the world economy is a context in which we felt it would be prudent to see if a bit of applied imagination could help find new ways out of these pressing dilemmas. Indian food comes in a huge variety across many regional and climatic zones as well as cultural and social categories that has a long tradition behind the form and pattern of consumption by the people of these places. While there are many similarities across zones, the differences are palpable and give a sense of distinction through both form and flavours. These are influenced by a huge variety of factors both local as well as global, and the change in both tastes and habits are rapid as they are deeply protected by the same people across all age barriers. Can we understand these dynamics and apply this understanding to discovering new ways forward that can help the economy, the health of the population and solve many associated problems such as poverty, malnutrition and hunger in our society? We do believe that design and innovation can not just solve some of these problems but also address the larger threats of climate change and political inequity through a better understanding of food surplus economy and access to healthy food to all humans across the planet. 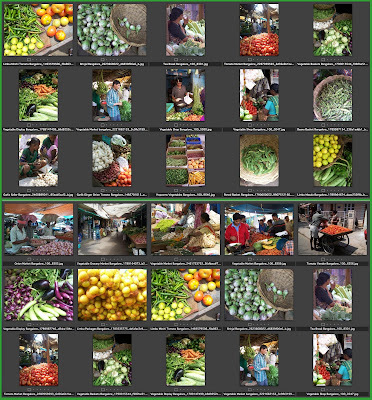 Image: Fruits and vegetables on the streets of Bangalore captured by an avid photo documenter, Rajesh Dangi, who shares his pictures on flickr rajesh-dangi’s photostream and on his blog called Bangalore Daily Photo. Having said that, we can now look at the micro details of food production, distribution and consumption in our own locations and juxtapose these with global trends and changing aspirations of people. The tools that are used by designers are many and one of the significant new tools is called anthro-design or design-ethnography which helps us understand the finer aspects of human aspirations and behavior which determines to a large extant the choices that will be made by people to satisfy their needs. These can also help us understand the facts and fiction, myths and realities that we have to confront in the process of shaping alternatives that can be then decided through the group processes of politics and social and economic negotiation. The texture of reality is very important in design thinking and action and that is why designers need to go out and look at the reality even if a whole lot of information is available in the form of socio-economic study reports and market statistics. Imagine if someone told you that a street vendor made a living selling a few kilos of guava, mangos, or cucumber by offering a service of slicing the fruit with a knife and a sprinkling of salt and masala, a subsistence living that is. Where does the value come from which he can make a living? A service offered where it is needed and appreciated and that which is informed by the local knowledge of seasonality and local preferences for taste and nutrition and of course the economic reality that fruit is expensive in India and not affordable to most but desired by all. You will not find many market survey reports on these guys but they are all over our streets if we care to look. 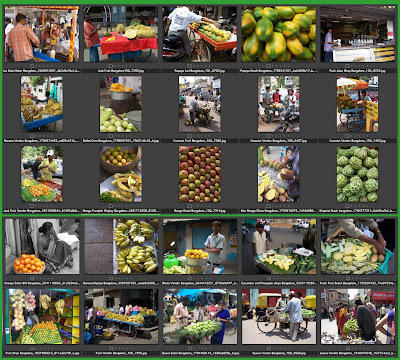 Rajesh Dangi,s pictures give us an honest view of this reality on the streets of Bangalore. The champions of anthro-design are growing in India and around the world and many new design companies and institutes are offering real research services to help understand the mind of the diverse user of services and products that is the foundation for any design and innovation programme. 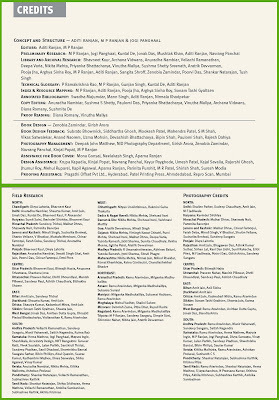 The discussion list called anthrodesign at yahoogroups.com is an active list that debates and shares insights about the skills and tools of the emerging discipline. Dori – Elizabeth Tunstall teaches the subject called Design Anthropology as an Associate Professor of Design Anthropology at University of Illinois at Chicago . Her blog Dori’s Moblog, is full of insights and very informative podcasts about the subject. Our own graduates have been offering this kind of research as a service to their corporate clients both in India and overseas. Uday Dandavate, an NID alumni, had set up the company called SonicRim along with his teacher, Liz Sanders from Ohio State University. Manoj Kotari, founder of Onio Design, Pune offers trend research to their clients as does Locus Design, Pune handled by three NID graduates, Chandrashekar Badve, Milind Risaildar & Siddharth Kabra and in the South, in Bangalore the IDIOM, which is the biggest design office in India, offers these services with a focus on retail business services. IDIOM is founded by NID graduates Sonia Manchanda, Jacob Mathew and Anand Aurora working in concert with Kishore Biyani, the retail mega star in India, the founder of the Big Baazar and Pantaloon and the Future Group in India. Image: Nokia Mobile Development Report prepared by Centre for Knowledge Societies in Bangalore. The digital version of the report can be downloaded from this link here as a 15 mb pdf file. In Bangalore there is another compelling presence in this business which is the Centre for Knowledge Societies which was founded by Dr Aditiya Dev Sood. CKS offers such design research insights into local markets and populations by mapping their aspirations and visually capturing the fine texture of the local along with statistical parameters that can inform innovation and design action in a variety of industries. The CKS report for NOKIA on the Mobile Telephones in India and more recently their “Emerging Economy Report: Societal Intelligence for Business Innovation” that offers insights on populations in Brazil, China, India, Indonesia, South Africa, Egypt and Keneya. This report is however a professional offering that can only be afforded by the multinational corporates however some information is available on the website. CKS has been in partnership with the Doors of Perception in assisting John Thackara in managing the DOORS events in India and this puts them in very good company indeed. John has been a impassioned advocate for design use at the local level and in his path breaking project DOTT07 with the Design Council, London took up Food as one of the thrust areas and his Doors of Perception too continues to promote the idea of local food and sensible consumption. Jogi Panghaal, an NID graduate and member of Doors, was the first design guru who sensitised us to the finer sensibilities of food in human society with his course offering called "Ways of Eating, way back in the early 90's. Well, we now know that anthro-design both meaningful and also draws big money, and it is a way forward to sense and find attitudes and aspirations that lie below the surface and something that can provide us with design insights that no amount of hard facts and knowledge that science can provide. AnthroDesign is also something that designers do all the time to make sense of the world around them and to get an insight into the minds and emotions of the users that they wish to serve. The Design Concepts and Concerns course which is taught at NID helps our students take the macro-micro design exploration route in their study and journey through the various pressing design problems and opportunities that we find in the Indian economy and that which is affecting the people most at the time when the course is being conducted are chosen each year. Design is always to be understood in context with a particular setting if we are to derive any meaning from the activity otherwise the meaning will be provided by the observer and this may not be the intended approach of the designers, in which case it is usually back to the drawing board. This year we have chosen to focus on “Food and Inflation”, two major issues that threaten the continuance of the Government of India if it is these concerns are not managed well enough and the global cues are not very helpful either, what with oil hitting the 145 USD mark over the weekend and with experts talking of a 200 USD level by the year end before things may start to cool off a bit, if at all. 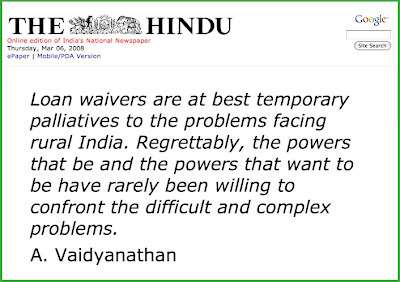 The Indian Government at the Centre, is led by the Congress Party, which is a historic cousin of the Indian National Congress that brought Independence to the country, and in this avatar it is having its own set of problems with its coalition partners, particularly on the contentious issue of signing the nuclear non-proliferation treaty with the USA and the international partner members which will give India some degree of energy security in the age of exploding oil prices. Energy is one of the key drivers of the Indian economy as it is the worlds and with rising oil prices all nations will have to address their energy security, especially if they are as dependent on imports as India is in its efforts to keep growth of the economy at a healthy 9 percent plus for the next few years. Here again it is not clear if going nuclear is the only way forward with a country that is endowed with plenty of sunshine and wind along its coastline, many possibilities could emerge if only we tried. Inflation kicking in at over 11 percent in the last week puts paid to all claims of sustained growth and in a democracy heading towards an impending election across the country the Government is pulling out all stops to help stem the inflation tide, particularly in the very sensitive food price front, which hits the common man in the street the most, and therefore would be a sore issue at the hustings. The search for stability is hard to find in a shaky coalition when the partners are unwilling to budge from the nuclear stand. During the last budget the Indian food situation came into sharp focus this year with many instances of farmer suicides in many parts of the country, especially in the Vidharbha region, and the Government made a magnanimous gesture of waiving all farm loans of small and marginal farmers and promised to support the banks through fiscal supports to provide them the safety net needed. This gesture ran into several tens of thousands of crores, and according to The Hindu, about Indian Rupees 60,000 crores (one crore is equal to ten million Rupees) when it was first announced in the budget speech by the Indian Finance Minister and later modified to a much higher sum, very generous indeed, but the problem that lies at the heart of this dilemma still remains unchanged. I wonder what would be the impact if even a small portion of this humungous sum of money were invested in the area of innovation in the food and agriculture sectors with a slightly longer term view, rather than by just looking down the barrel of the next General Elections a few months away? The use of subsidies when there is a political and economic crisis is quite commonplace but making investments in basic innovations that can provide long term answers to wicked problems is not seen as a practical move in our land of five year terms of public office and short term politics. Can we continue in this strain for long with all the negative cues coming from the global warming front and the economic downturn that is raising its head from the rising oil prices and to top it all the social unrest unleashed due to pressures of change and transformation like the opposition to the SEZ’s at Nandigram and Singur where the local farmers are up in arms against the TATA Nano project? These are not simple problems but we do believe that the boundaries of these problems can be explored through the use of design rather than on the streets through negotiations between adversaries from opposite parties. Design can if given a chance can indeed find and show alternate models that could then be presented to all stake-holders for a negotiated settlement of the conflicts. 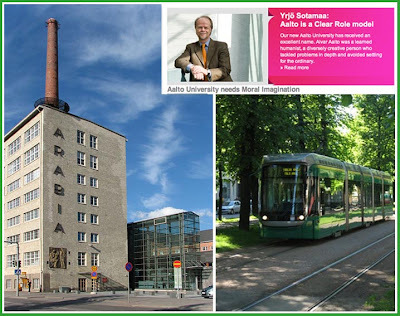 This form of innovation and change is at the heart of the future of politics and many countries are now beginning to recognize this power of design visualization and a recent example is the Helsinki event that merged three major Universities to form the new Innovation University which has been christened the Aalto University after the great Finnish architect and designer, more about this in my previous post on this subject. We will not wait for the Government of India to change its policies about education and innovations in India but forge ahead instead with some basic explorations that can be done on our own in the classrooms at NID with the creative human capital that is available in the motivated students who have come to learn design at our school. In my paper titled “Creating the Unknowable: Designing the Future in Education” that I had presented at a peer reviewed design conference, EAD06 in Bremen, Germany in 2005, I have given an outline of the course called “Design Concepts and Concerns” that has been offered to NID students of all programmes over the past fifteen years. The blog that was set up last year to document this course in a contemporaneous manner can be seen at this link below and last year the theme was Water, which happens to be the most contentious issue across India and the world, which is getting worse by the day. Here we looked at the macro-micro design analysis of the context to understand the situation at a personal level of each student participant and then went on to build alternate models to address these issues through design imagination and innovative offerings. The course ended with a long list of design opportunities and some of these were selected by the groups of students to be visualized as scenarios that could make the imagined outcomes more visible and tangible for decision making processes that would be political and participatory, both people and the Government could be stake holders along a long chain of interest groups, al of whom could have an informed say in the matter that would affect all of us. 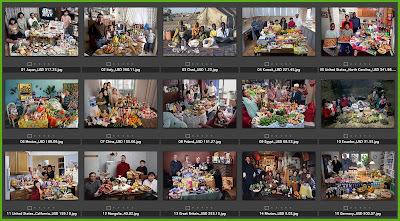 Take a look at what they had to offer and give your comments and feedback for this year’s theme, FOOD & Inflation. More at the Design Concepts and Concerns blog here.